During the station redesign, underground bike parking was installed at the station along with a wheel ramp for easy access. The 16th Street BART station was once a bleak, uninviting, and unsafe transportation hub of San Francisco's Mission District, but a 7-year planning process, community and public agency support, and TE funds transformed the station into the vibrant public plaza and community meeting place it is today. The groups participating in the planning process include BART, the Metropolitan Transportation Commission, the San Francisco County Transportation Authority, Mission Housing Development Corporation, Urban Ecology, and the Mission Community Council. Today, the 16th Street BART Station Plaza is the realized vision of the community. 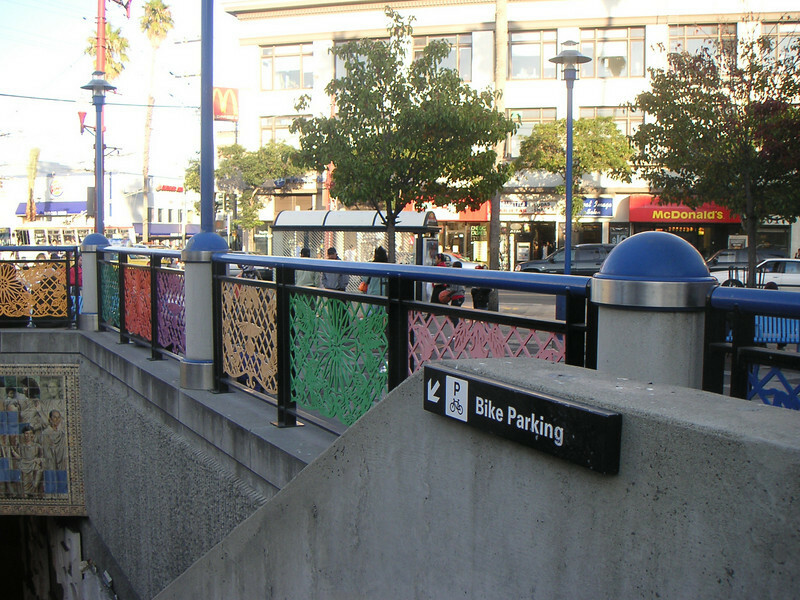 Vibrant mosaics, sitting steps, colorful, artistic gates, benches, and the Plaza 16 Project, an outdoor gallery in the plaza that displays work by local artists, makes the station a welcoming place to rendezvous with a friend or make a transit connection. Two TE grants, in 2002 and 2005, amounting to a total of $2,996,000 leveraged $428,000 in local support.